I haven’t been checking in here for the past few days ‘cos I was (and still) having so much fun in a birthday party organised by Scrapbook Deals 4U, it is their 2nd anniversary! Definitely with lots of fun challenges, all 16 of them! So far I’ve done 3. It is really good in getting those photos done, especially those that I’ve been dragging on on what to do to them. 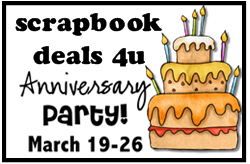 And if you are really low in mojo, head on over to Scrapbook Deals 4U’s forum and start joining in those challenges, surely you will at least get something done and they are offering great prizes for the winners too, so do check it out and please let me know if you are going to. Oh, and while you are there, check out their monthly kits! It is filled with yummy goodies and really pretty kits that Martha has put up with. I love all their kits! And you can do so much with the kits! Another great news is, Pamela Young is having a week-long giveaway over at her blog, you won’t wanna miss this. She is also having a site for challenges over here where you can get lots of inspiration if you are running out of idea. So there, two great fun with prizes waiting for you, happy scrapping!